RSI or repetitive strain injury is a general term rather than a specific diagnosis used to describe gradual onset pain, usually in the forearm, wrist, and hand. RSI is a term that covers several different causes of wrist pain, but all are exacerbated by certain repetitive movements, whether they’re from sport or from work. We look in more detail at the causes and treatments of this wrist injury. RSI symptoms develop gradually over time becoming more and more severe. Symptoms include pain in the wrist, forearm, and hand which may be a sharp pain, a dull ache or throbbing sensation. Tingling and numbness may also be present in some cases. Initially, the symptoms tend to only occur whilst performing the aggravating activity, however with no rest or treatment constant pain results. Carpal tunnel syndrome which is a compression of a nerve as it passes through the wrist. Wrist tendonitis which is inflammation or degeneration of the tendons which join muscles to bones in the wrist and hand. 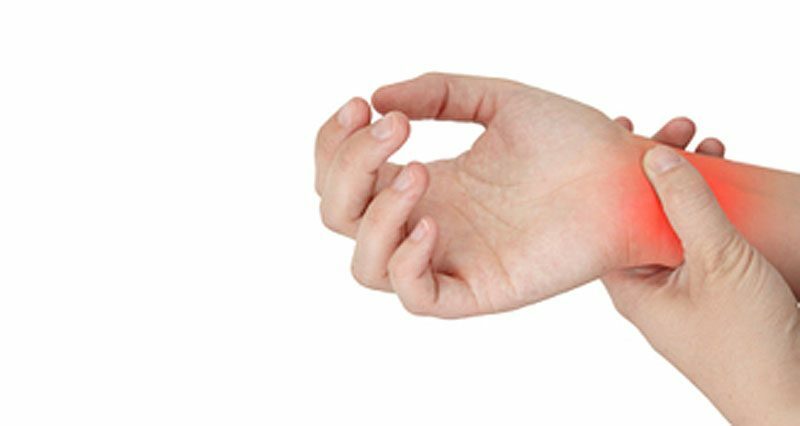 Wrist bursitis or inflammation of the small sacks of fluid found in joints which sit between tendons and bone to help lubricate movement. Work-related RSI injuries are usually exacerbated by factors such as poor posture, inadequate wrist support or desk set-up or inadequate equipment. Sports-related RSI is usually caused by overtraining and/or poor technique. Type 1 RSI includes conditions, such as carpal tunnel syndrome, de Quervain’s tenosynovitis, and frozen shoulder. These conditions are often a result of overuse, but not always. They also often present with symptoms which are atypical of RSI’s, for example, swelling and inflammation, which are not present in true RSI conditions. Type 2 RSI conditions are less well defined. There is no swelling or inflammation, and sometimes the cause of the pain is not known. Repetitive motion is always a factor though. These conditions are true repetitive strain injuries although are often given other names, such as diffuse RSI, occupational overuse syndrome and non-specific pain syndrome. There is no test or imaging which can diagnose RSI. Diagnosis is therefore made based on a history of the client’s condition, symptoms, occupation and sporting involvement. Often surgeons and doctors are reluctant to diagnose RSI as it is not a specific injury, and can have significant implications regarding insurance claims. It is important to get a correct diagnosis to identify the specific injury or condition which is causing the pain. Only then can the proper treatment and rehabilitation program be prescribed. However, in general, there are some things you can do to relieve the symptoms of repetitive strain injury. Take regular breaks. Move about and stretch the arms, shoulders, upper back, and wrists. The use of a wrist brace or support can help in the early stages to provide additional support and comfort. Apply cold therapy when it is stiff or painful to reduce pain and inflammation. For conditions which have become inflamed, anti-inflammatory medication such as ibuprofen can be prescribed. Always consult a doctor before taking medication and never take Ibuprofen if you have asthma. Provide strengthening or stretching exercises to help improve your posture and strengthen the associated muscles. Exercises should only be done pain-free and exercising a joint that is overused where pain and inflammation are present will make matters worse rather than better. Therapies such as massage, ultrasound, and acupuncture have been shown to help in some cases. It is important to obtain a correct diagnosis of your exact condition before any massage or electrotherapy treatment is administered.